BritishV8 Forum: New to the Gallery: Don Childs' TR6 V8! 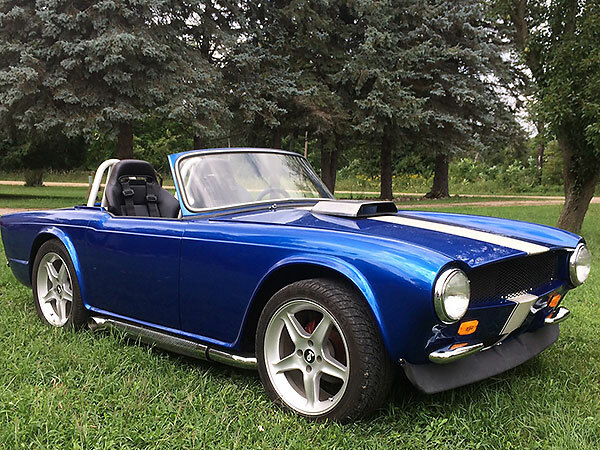 New to the Gallery: Don Childs' TR6 V8! Please join me in congratulating Don on a job well done! Re: New to the Gallery: Don Childs' TR6 V8! How many meanings intended in the vanity plate? Edited 1 time(s). Last edit at 07/19/2017 02:56PM by Dan B. Great Job and even better color! Congrats! I see you have a T5 transmission. From the gearset you stated with the 3.97 first gear. Is this the transmission for Ford 2.3's rated at 240 ft Ibs? 1) How has it held up? You have some very fast times posted and you have a lot of tire stickiness. 2) Are you using a shifter relocator? From the pictures of the cockpit the shifter appears to be a nice forward location, but the off body chassis picture shows the shifter location back kind of far. If you are using a shifter relocator which one are you using? And how do you like it? I am thinking about a T5Z with a 302, warmed over a bit. And I am only going to run 205/70's. I want to hear from folks about their shifter relocation brands and their success with the shifters. I thought about a TKO as it has multiple locations, but money, weight, and other issues mean I am trying to avoid it. My engine will never overpower the TKO, but with the T5Z I will be over the rated torque. But I am not going to be banging thru the gears very often. Tork, I used a '97 Ford Explorer engine as the basis for my build specifically for the short front engine dress. The water pump, timing cover and front damper/pulley are the shortest Ford used on the Windsor 5.0. I spaced my crank pulley just 1/2" behind the steering rack, and with a standard T5 Mustang unit and a straight shifter, I am right where the old shift ball was. The original Triumph shifter base was closer to the firewall, but has a 5" bend (memory here, was it 5 or 3??). Take a look at the pictures in my project journal under Dennis' TR6. I suspect since you seem to have your engine already installed - is that correct? Then you would have to use that as a start. Options are S-10, rare Astro van or custom tailshaft housings. Or the TKO, which was over my budget. T5 at least upgraded to the 300# rating. One last comment, is that I have a 3.35 1st gear, a 3.54 R200, with 205X65-15 tires, and think my low gear is maybe a little too low. Starting in 2nd is pretty easy (hey, I drive an automatic most of the time! ), and the 2.95 of the T5Z might be nice. I think I get 10 mph in 1st @ 1600 rpm, which gives ~ 37 mph a@ 6000. That's ok for a drag car I guess, but for me, I would like a little longer run before shifting. I have NO intention of ever doing a drop the clutch start, stop light drags are 20-25 and punch it for me! I found your posting in the Project Journal section. So I added/will add my questions there in the parallel thread. My question here was to Don's use of the T5 with the 3.97 first gear. If it is holding up for him, then a T5Z will work for me. His power and tires are well above what I have or plan. Right now I have a 302 with an AOD. Since I drive all automatics, I want a manual. Not official...done with stopwatch & apps. These cars are very light and do not stress the driveline much. Quick times are the result of a very stiff chassis, good tires & the rear suspension having the correct anti-squat geometry. Here's the link to my project journal.